I have been fishing for as long as I can remember. I have fond memories of camping / fishing trips with my Father fishing the surf and piers for Gummy Sharks, Snapper & Salmon. The majority of the fishing I did in the early days involved soaking bait. Nowadays, fishing plays a huge part in my life and I love to get out and chase a wide range of species covering Estuary, Offshore and Freshwater scenarios. I find myself fishing artificials a lot more than bait though these days. Living in Colac, in South West Victoria I am privileged to have such a diverse range of options close at hand. I began tournament fishing for bream in 2007 and have continued to do so ever since. Along the way I have met some great people, learnt a hell of a lot and also enjoyed some success at the same time. 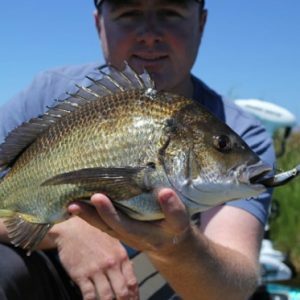 Tournament fishing so far has enabled me to get out and visit some of the more pristine and premier bream fishing locations in Victoria, Queensland and Tasmania. My most memorable moment to date was fishing the 2010 Skeeter National Bream Classic at the Gippsland Lakes. With a massive field of boats and quality anglers from all over Australia competing it was going to take something special to win. With a 2 day 10 fish bag of bream weighing 11.86kgs we did just that and to share the spoils of a new boat with good friend Steve Parker is a moment not easily forgotten. The 11.86kgs still stands today as a record for the largest bag of bream weighed at a National Grand Final. My favorite methods of fishing include shallow flats and edges using hardbodies where the Megabass X 55 in Avocado is a real standout. Then there is the very addictive topwater bream bite where I like to throw 2 ½” Atomic Pink Core Paddle Tails, there is just something about this fishing style that is so addictive and I can’t seem to get enough of it. Bream: For the simple fact that they can be caught using so many different methods and it is forever a challenge trying to work them out on any given day. Southern Bluefin Tuna: These things are serious line burner and make themselves available to target for only a couple of months of the year. These guys test the gear and the angler to the limit especially when they are up over the 100kg mark. Snapper: Another species which I really like to target fishing with lures & soft plastics when conditions allow. Snapper hit hard and fight well all the way to the boat making them an enjoyable species to chase.